On Monday, Apple announced it had removed hundreds of podcasts produced by InfoWars from its iTunes and podcast apps. Facebook said it had removed four pages belonging to InfoWars founder Alex Jones. And music-sharing app Spotify said it would be removing all InfoWars podcasts available on the site, following last week’s removal of some InfoWars content. 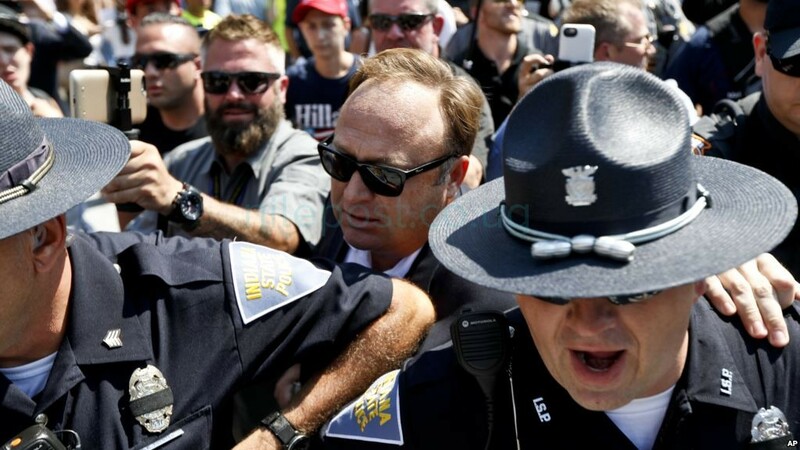 Jones has gained notoriety for spreading unsubstantiated conspiracy theories, including claiming that the terrorist attacks on the World Trade Center on 9/11 and the 2012 Sandy Hook Elementary School shooting in Connecticut were hoaxes perpetrated by the U.S. government. Jones has also repeatedly used inflammatory language against transgender people and Muslims, one of the reasons Facebook said forced it to remove his content. Apple said it removed all of the content from five of six InfoWars shows from its platforms. As of Monday, only one InfoWars podcast, named RealNews with David Knight, remained on iTunes. In July, Facebook and YouTube announced they had removed four of Jones’s videos from their sites. Two of the videos claimed without evidence that Muslims were taking over several European countries. Another compared the creators of a show about drag queens to satanists. YouTube followed suit and banned Jones’s channel on Monday afternoon, claiming the account, which had over 2.4 million subscribers, violated the site’s guidelines on hate speech. In recent weeks, Jones garnered increased attention as the parents of children killed in the Connecticut shooting sued him for defamation. While Jones said he now believes the shooting was not a hoax, he said his earlier claims were protected under U.S. free speech laws. In July, Jones also appeared to threaten special counsel Robert Mueller, who is currently investigating U.S. President Donald Trump and his campaign for potential Russian influence. While Jones’s beliefs have often been characterized as fringe, he has found some mainstream appeal. In December 2015, Trump, then a candidate, appeared on InfoWars via a satellite interview. “Your reputation is amazing. I will not let you down,” Trump said to Jones.